Canning is an economical and nutritional way to preserve fresh quality grown fruits and vegetables at home without added preservatives or pesticides. The set includes a funnel with an easy fit design for regular and wide-mouth jars; tongs with coated handles for lifting foods when canning or cooking; magnetic jar Lid Lifter for safely keeping fingers from touching hot water when placing lids on jars; a jar lifter for removing hot jars with one hand. The ends of the Jar Lifter are coated for better grip on jars. The jar wrench easily opens screw on jar caps. A 9 inch colander is perfect for washing and draining your foods before putting into the jars. The 21 quart canner with rack is just the right size for holding 7 one quart jars. Also includes a 7 1/2 quart blancher with drainer insert. Use for blanching produce in preparation for freezer or for cold pack canning. Set includes 21 quart canner, canner lid, blancher pot, blancher insert, blancher lid, jar rack, colander, lid wrench, magnetic lid lifter, tongs, jar lifter and funnel. 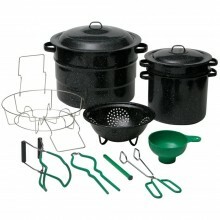 Click the button below to add the 12 piece Canning Set Granite Ware to your wish list.